Since launching in 2005 – when it was the very first organisation of its kind in Australia – Fitted for Work has helped over 28,000 women experiencing disadvantage find and keep work. It does this by providing free interview-appropriate clothing, interview preparation, mentoring, presentation workshops and staying employed programs and the results speaks for themselves: 64 per cent of women who go through the not-for-profit (NFP) find work within four months. 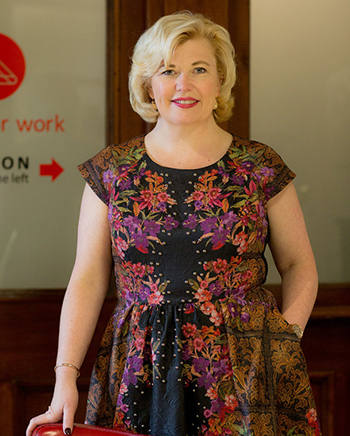 We catch up with its CEO Donna de Zwart. In 2016, Fitted for Work was a Victorian finalist for the Telstra Australian Business Awards and in 2015, in an innovative pilot with Yarra Trams, it placed 40 women into tram driver roles. It’s headquartered in Melbourne and also has a presence in Sydney’s Parramatta. How do you partner with the Victorian Government? We work with women in correctional facilities and assist departments such as the Department of Health and Human Services to reach a diverse range of employees. We’ve also received a $150,000 grant to match Jobs Victoria Employment Network providers with female job seekers. It’s exciting to be working with a government that’s proactive in making the lives of Victorian women better across several fronts. Why have a social enterprise exclusively for women? When we help one woman find work, there’s a ripple effect. The economic security employment provides makes a huge difference to a woman’s physical wellbeing, but it’s also about the dignity, sense of purpose and self-esteem that work brings. The way a woman values herself has an impact on the way she goes home and parents her children, the way she engages with the wider community, the way she enriches her workplace and ultimately, the impact on the Australian economy. Tell us about that economic impact. If Fitted to Work is able to increase workforce participation rates of women in Australia by just five per cent in the next 10 years, this would add $165 billion to our economy. Disadvantage can happen to any woman, at any time in her life. What’s the most moving moment you’ve experienced in your role? There are so many. However, the one that stays with me is when we secured work for a young single mum. The week before she got the role, she was Googling how to live in her car with her children. This was not only emotional but sobering. It emphasised how critical the services we offer are, and how they change the lives of not only our clients but their families as well. When you launched in 2005, there was no other organisation like yours in the Australian marketplace. How many similar employment organisations have sprung up since? There are now variations on what we do throughout Australia. Unfortunately, there’s more than enough disadvantage to go around, so I imagine we’re all kept busy. Fitted for Work’s point of difference is that we provide an end-to-end service for clients. We work with women experiencing disadvantage to not only get them work-ready and fitted for life, but to transform them from clients into job candidates. What’s been the key to your organisation’s ongoing success? A simple and elegant formula in assisting women into economic security and never forgetting that every woman’s experience and journey into disadvantage is unique and requires an individual plan. We offer this and it gets results. More broadly, how has the Victorian NFP landscape changed since 2005? The NFP sector is now incredibly busy; the number of new charities or social enterprises that have started since our launch is staggering. This has meant increased competition particularly in the area of trusts and foundations, as well as general donor fatigue. With that in mind, how do you engage with corporates? We work with companies interested in shared value. We have incredibly supportive corporate partners who are prepared to commit long term, over a number of years. They help us grow by investing in our infrastructure, which is not always the most exciting way to engage with our organisation but it’s fundamental to our development if we’re to reach more women who need us. And how do you show the corporate and government sector that its mutually beneficial to work with your NFP? By explaining how buying from, and engaging with, our social enterprise is good for their business. It demonstrates corporate social responsibility leadership in a shared value model; increases brand equity and market credibility; provides market cut-through with a compelling point of difference; delivers against diversity targets; increases sales and market share; generates positive public relations and media coverage; and helps their employee value proposition attraction, retention and engagement. It’s the hardest job I’ve ever done – it’s stretched me professionally, mentally, emotionally and physically and that’s a good thing. I’ve learnt more in the last three years than I have in the last 10. I love the creativity the role requires and the down-to-earth perspective our clients provide. And what’s your vision as CEO? The job is bigger than me: I have a vision for Australia where women have an equal voice in every part of society including the workplace, local community, arts, religion and government. Currently, the representation of women is too low across the board. Consequently, women are not heard, not valued and most importantly, not empowered to make their full contribution towards a kinder, more sustainable world. Employing women from diverse backgrounds into a variety of positions – witnessing their personal and professional growth has been a privilege. What’s the best lesson you’ve learnt about leadership? I’ve come to understand the importance of leading by example. People don’t always listen to what you say, but they do watch everything you do. Leadership is about being authentic in both your words and actions.